Ever since Disney announced the cast for The Lion King remake, we've been patiently waiting to get a few first-look photos of the star-studded team. 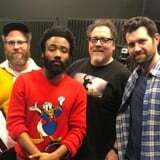 Thankfully, Seth Rogen, who will play Pumbaa, gave the people what they wanted and posted a photo with a couple of his castmates: Donald Glover, who will play Simba, and Billy Eichner, who will play Timon. The three posed alongside director Jon Favreau in the snapshot. Rogen simply captioned the photo with lion and crown emoji. Rogen, Glover, and Eichner will fight for Simba's kingdom in 2019 with Beyoncé as Nala, James Earl Jones as Mufasa, and John Oliver as Zazu. If ever there was an all-star cast, this right here is it. When we heard there would be a Lion King remake, we were really hoping it wouldn't ruin such an amazing classic, but with these phenomenal actors and entertainers, we can comfortably say hakuna matata.